Get ready for your “awwwwww” jaw to drop … because Kim Kardashian West‘s latest Instagram pic is pretty dang cute. 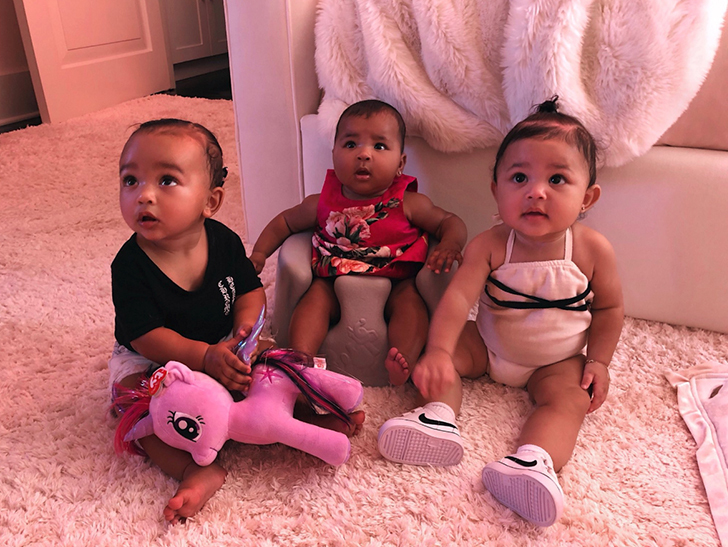 Kim shared a photo of all 3 of the Kardashian family baby girls — her daughter Chi on the left, Khloe‘s daughter True in the middle, and Kylie‘s daughter Stormi on the right — sitting on a soft, fuzzy carpet together looking up at … something that caught all their attention. Kim captioned it “The Triplets” with heart emojis … and also tagged her sisters in the pic. If you’re keeping track, Chicago is 8 months old … True is 5 months … and Stormi is 7 and a half. No word why Stormi’s the only one wearing shoes.